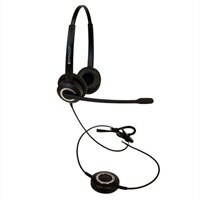 Spracht ZUM ZUMRJ9B Headset For Desktop Phones (Binaural)ZUM headset includes a comfortable headset with noise cancellation so you can hear and be heard well. If you spend a lot of time on the phone, this product will give you flexibility and freedom of movement you never had before. ZUM headset includes a comfortable headset with noise cancellation so you can hear and be heard well. If you spend a lot of time on the phone, this product will give you flexibility and freedom of movement you never had before.